“It was me knowing my family was in crisis and knowing that I had to make a choice between providing for my children or caring for my children,” she told the morning show’s co-host Matt Lauer Thursday in an exclusive interview. 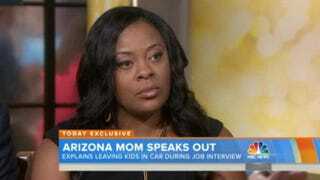 She was arrested in March on felony child abuse charges after leaving her 6-month-old and 2-year-old sons in a parked vehicle during a job interview in Scottsdale, Ariz. Her story sparked an outpouring of social media and financial support. She received more than $100,000 from an online fundraiser, which she will use to set up a court-ordered college fund for her two young boys and an older child, who was not in the car. The college fund is part of a deal reached last week with prosecutors, who dropped the child abuse charges against Taylor as part of an agreement to complete parenting and substance abuse programs. The incident began last March when a sitter, scheduled to watch her young sons, bailed on Taylor at the last minute, forcing her to take them with her. She left them “strapped in their car seats, the doors unlocked, the keys in the ignition and the windows cracked open an inch, according to police, who estimate that the temperature inside the vehicle climbed beyond 100 degrees while she was away,” Today writes. She is currently working to regain custody of her children, who are staying with family.